"...there are still 110,000 refugees left in Europe alone, of whom 22,000 under the mandate of the United Nations High Commissioner for Refugees are mouldering away in camps, as most of them have been for the last fifteen years [1945-1960]. Believing that first hand reporting might stir pity, open pocket-books, and even relax restrictions more effectively than speeches or statistics, the office of the U.N.H.C.R. 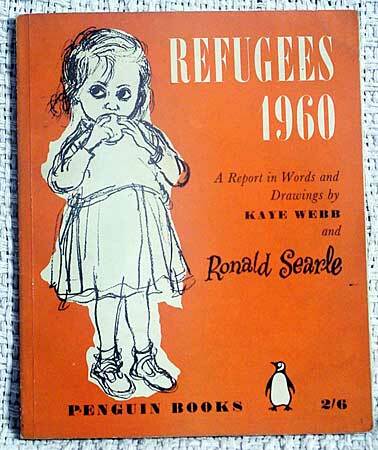 invited Ronald Searle and Kaye Webb to visit some of the camps in Austria, Italy, and Greece. In this book they submit their report." All proceeds from the sale of this book went to the United Kingdom Committee of the World Refugee Year. Working under conditions so appalling with no one to ask for help as slave labour on the Thailand to Burma Railway, some men just gave up and died as there did not seem any hope of survival. There were a few that decided they would leave something to let the world know the truth. This is a collection of paintings that are a tribute to the brave men [and women] who painted them, as putting anything down on paper was punishable by death. Not all the works have survived some were found and the punishment was usually swift for the artist. Juices from plants found in the jungle, crushed pencil lead, clay and even blood were used as pigments and paint brushes were made from human hair with thin bamboo as the handle, the diaries and paintings were hidden under bunks inside bamboo and even buried in the jungle. " This site includes the humorous work for which Searle is perhaps better known.